Tags are so fun to make! 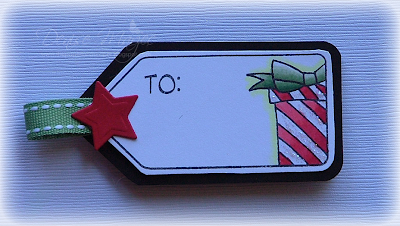 Here's another one using my No Peeking set from Our Craft Lounge. I added some stardust Stickles to the white parts on the present. I love making them too but hate to USE them....haha! Fabulous girl! SUPER cute Denise! LOVE the sparkle and the GORGEOUS shading on this! I have such good intentions every year but never seem to get around to making tags....what I need is for my little orange buddy to come to Texas and give me a swift kick in the rear to get me started...LOL!!!! This is adorable, Denise...thanks for the inspiration!!!! You're so far ahead of the game with all these great tags you're making - I'm envious!! Adorable tag, Denise! The sparkle is wonderful. It's simple, but PERFECT! just what we all need for mass producing at Xmas. Thanks for sharing! You've been rockin' some tags, girl! They're all fabulous! Wow! Thanks for making this annual "need" appear to be so easy-peasy ... and darling to boot! 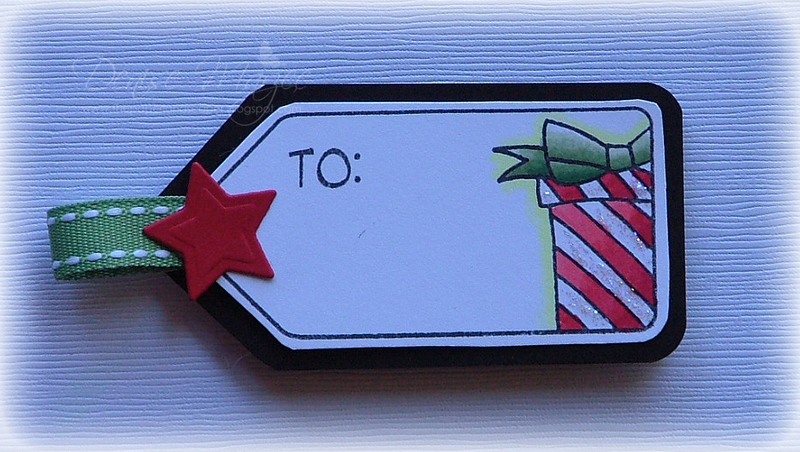 Love your sweet little perfectly colored tag! !